The Blue Valley School District Board of Education (BVSD) appointed two new commissioners to the Blue Valley Recreation Commission. Lynn Spraetz will serve as the at-large representative and Clay Norkey will represent the south district while he finishes out the 2015-16 term left vacant by Brendan O'Grady's resignation. Both began their stint as commissioners at the August Commission meeting. Spraetz moved to the Blue Valley area 13 years ago and quickly became active in the community. She assumed positions with various PTOs in the Blue Valley School District. A member of the CAPS advisory board and BVSD technology committee, Spraetz is committed to continued growth and fiscal responsibility for long-term success. Norkey has been a fixture in the area for 17 years. Most recently, he sat on Blue Valley Rec's Baseball Advisory Council and was a member of the Site Based Leadership Team with Blue Valley West High School. He also serves on various professional and community agencies. As the current president of the Lawyers Association of Kansas City, Norkey shows a desire to help organizations succeed and grow. 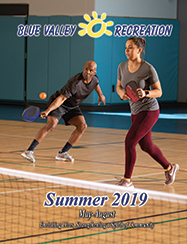 "The Blue Valley Recreation Commission is fortunate to have these two on the board," said current Commission chair Colleen Browne. "Their passion for volunteering and their love of the community fits well with Blue Valley Rec's vision. Volunteer commissioners have a passion for enriching the lives of local residents through recreational activities and sports. The seven member s serve as a policy-setting board for the organization and meets monthly. Each commissioner serves on a committee comprised of staff and citizen members from the community.